Black and white negative of an unidentified man standing in a boat in the weeds close to shore. He has his paddles in either hand. He is smoking a pipe and looking at the photographer. 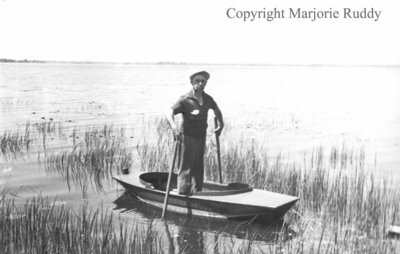 Unidentified Man in a Boat, c.1947, Marjorie Ruddy. Whitby Archives A2013_040_844B.